I recently got a tattoo, something that M and I have been talking about doing together for 3+ years. The idea of what I wanted to get done has been with me for twice that long. Copper Canyon Press uses the Chinese character for poetry (shi) for its trademark. It’s comprised of two parts: “word” on the left, “temple” on the right. Jack, the tattoo artist, called the line surrounding the character a cartouche. I just today looked up what a cartouche is: in Egyptian hieroglyphics, it’s an oblong enclosure with a horizontal line at one end, indicating that the text enclosed is a royal name. 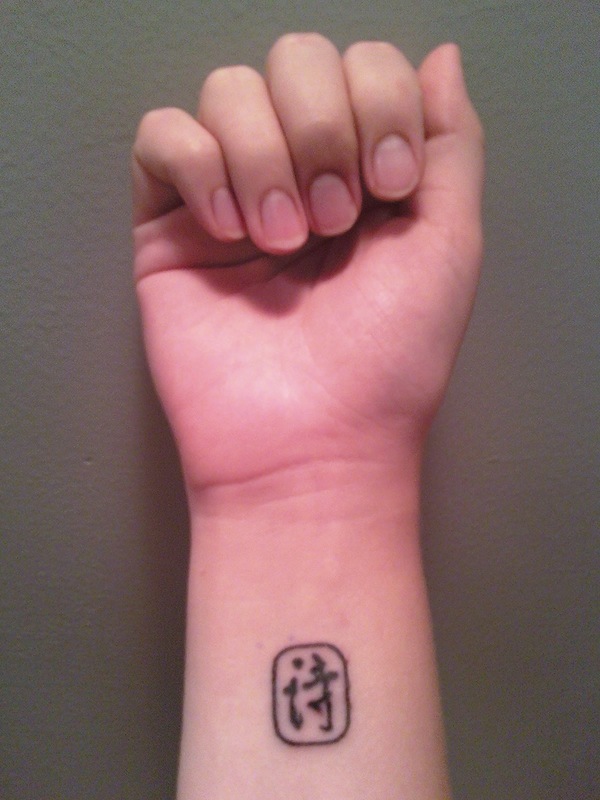 My cartouche lacks the horizontal emphasis, but I love this added royal dimension to the permanent mark on my skin. Dimensions, meanings, symbols—whatever I want to call them, there are several. I’ve always been enamored with poems, and this tattoo symbolizes that love. Poems often feel sacred, even if the subject is ordinary; so the literal meaning of temple of words rings true to me. My body is fearfully and wonderfully made, and with all of its flaws—or perhaps because of them—it is a temple. Despite the frustrations and doubts I have when I consider my faith, Christ still is impossibly, paradoxically, the Word to me, and so this tattoo is a nod to that mystery as well. I don’t write much poetry these days, but I try to read as much as I can. It is like a friend I can still have intimate conversations with, but who no longer lives next door, and I miss its presence. I miss this friend, and so having its beauty on my skin lets me carry it around with me at all times. When people ask, I usually tell them the truncated version: it means poetry, literally temple of words. Sometimes I don’t even want to say the word poetry, because many people have bad experiences with the genre. (Where was it that I read someone felt like their brother was holding them to the bottom of a pool whenever they tried to read poetry?) To me, it’s not even a genre, it is life; my child is a poem, that movie is a poem, this floor scattered with crumbs is a poem, that dumpy bar in northern Wisconsin is a poem, this silence in the house is a poem, the way the grocery bagger packs your Chilean grapes and cage-free eggs is a poem. Looking at the tattoo straight on, it is perfectly centered and perfectly straight; when I raise my hand to wave, or when I twist my wrist ever so slightly to type or stir the soup or pick my kid up, the upper left corner of the cartouche slightly tugs itself up, and the bottom right corner tugs down in the opposite direction, so that it almost resembles a parallelogram. I watch this malleability in the mirror, as I raise my arm to and fro, and marvel at my skin, how it glides across the tissues and ligaments so freely. I remember sitting next to my grandma when I was little, when she would smooth her soft fingers up and down my forearm. I’ve unconsciously repeated this soothing gesture with Marshall, and he always stops me because it’s too ticklish. I’m looking forward to soothe my grandchildren that way. My tattoo will be 40% blurred by then; even something as permanent as ink in my skin can’t escape the breakdown of age. I didn’t intend to talk about my grandma, or even include the following poem. But writing about my forearm and my skin there makes me think of her. A lot of things have been reminding me of her lately. I miss her. I wish she lived next door. You always find the most amazing poems. I’ve never purchased one of those “best of” anthologies, but if you edit one, I’ll make room on my shelf. love, love, love the tattoo. we should start a wrist tattoo club. what’d m get? Alison, Marsh got a 3D-looking shadow of a cross on the top of his right foot. It looks soooo good.